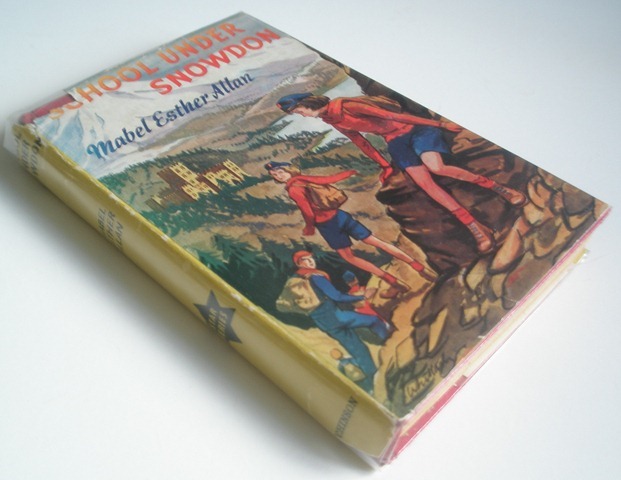 School Under Snowdon was published by Hutchinson in 1950. 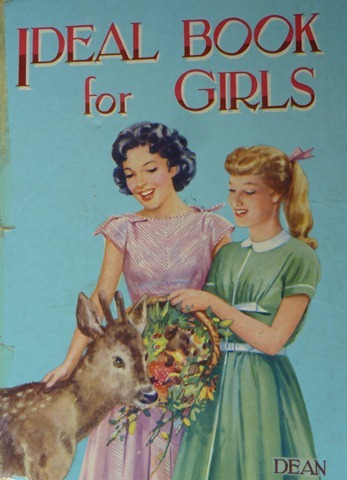 My copy doesn’t have a dustjacket, but I found this one on the internet. Much more common is the reprint in the Star Series, which again isn’t dated, but bears the words ‘second impression’. 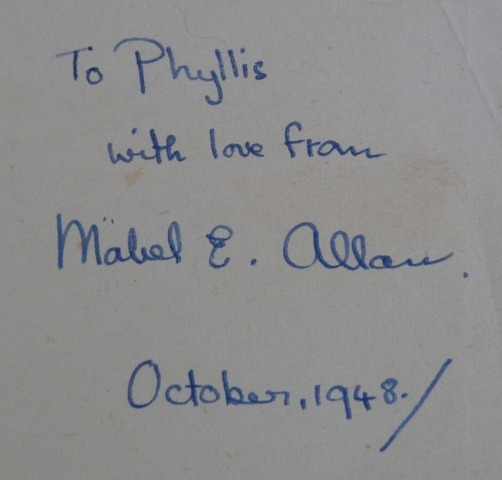 MEA makes very little mention of this book in her autobiographical writings, there is just a brief mention regarding the location. Verity Armitage has lived all her life near Ryde on the Isle of Wight, and has only left the island a few times. The book opens five days after the funeral of Verity’s father, her mother having died previously, and her aunt has come to take charge of her. Verity is aghast at the thought of leaving her home, and wildly plans to live with the old lady in the flat beneath theirs, and make her living by writing, but naturally she is not allowed to do this. Her aunt proposes that she should live with them and go to school in the Welsh mountains with her cousins, Daffila and Idwal. 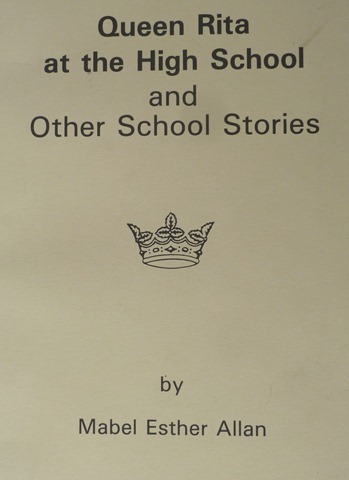 This horrifies her even more, as she is sure that she will not be able to take her typewriter and continue writing the book she is halfway through, but her aunt reassures her that it is an unusual school, being co-educational and run on much more relaxed lines than most boarding schools. On arrival at Shrewsbury, Daffila has come to meet them with her father, and is horrified when Verity declares that she will hate Llanrhysydd Castle. She is sure that Verity will love it once she gets used to it, especially the climbing, but Verity is equally sure that she won’t. Daffila is particularly upset because a rule has been passed by the school council that no one under 15 is to do any climbing, following an accident the previous term. 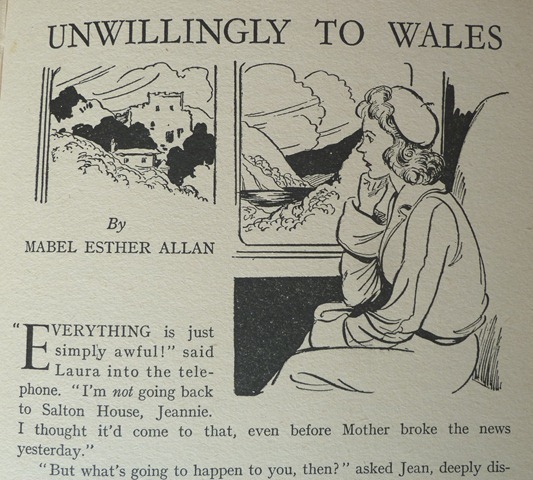 On arrival at the Griffiths’ house things are no better, Verity is miserable and refuses to join in the conversation, and later overhears Daffila saying to her mother that she wishes Verity wasn’t going to Llanrhysydd and that she doesn’t want to be burdened with a ‘dying duck’. Verity is hurt and angry, and resolves not to be a burden on her cousin. At Chester station on the way to school, Verity meets Gwenllian Davis – she first overhears a conversation between Gwen and her parents, indicating that there is a mystery about her presence at the school. Gwen then rescues Verity as she is trying to run away, and they join the train together. They find themselves in a compartment with some of the seniors, who are talking about climbing, Verity is horrified by the very idea, but Gwen absently says that she knows more about climbing than the others, although she in turn is horrified to find that she will not be able to climb at school until she is fifteen. Gwenllian behaves strangely on arrival at school, but Verity is just overwhelmed, and needling to escape, she finds her way to a room in one of the towers. To relieve her misery she writes a poem, but is disturbed by the owners of the room, the ‘Bardic Circle’, an elite group who have all proved themselves in some artistic endeavour. Gwenllian is also found to be there, and is furious to find that she may not use the room as she pleases. Summoned to meet Mr Morgan, the headmaster, Verity is amazed to find that her writing will be taken seriously at Llanrhysydd, and that time for writing will be in her timetable. She is allowed to concentrate on English subjects, but has to do a certain amount of maths in order to take School Certificate. 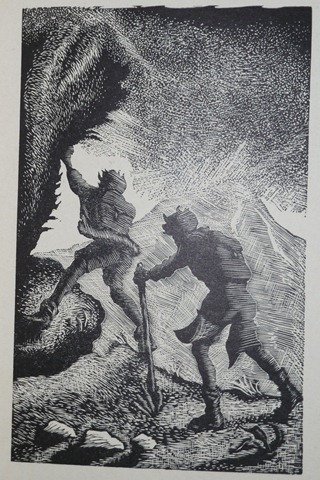 The next day Gwenllian suggests that the two of them climb Rhysydd Fach, despite the rule forbidding them to climb, and Verity reluctantly agrees. They are nearly at the top when they meet Owen, one of the senior boys, on his way down. He forces them to turn back and return with him, at which Gwenllian is furious. A big part of school life is helping on the farm attached to the castle, but Gwenllian refuses to go near the farm. Verity reluctantly agrees to go to the farm, despite her fear of cows. Miss Moon takes a group including Verity and Gwenllian for a scramble, and Verity’s worst fears come true when she freezes at a tricky point. She expects ridicule from the others, but is surprised to find they treat her with friendliness and sympathy. Verity slowly starts to settle at the school, but still needs to get away, and finds a linen cupboard where she can be private and work on her book. 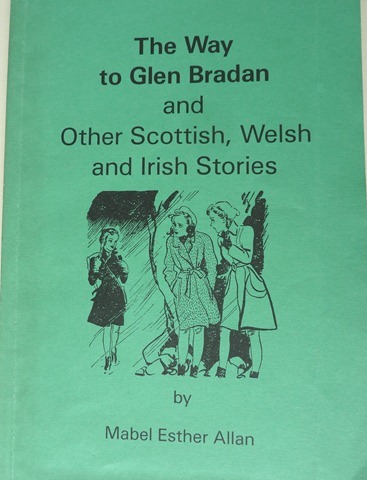 She is in the habit of reading it aloud to herself to check it over, and one night is amazed to find that she has an audience – Gwenllian is also in the cupboard, and is very impressed by the book. She also finds and reads the poem which Verity wrote at the beginning of term, and suggests that she send it to a poetry magazine. 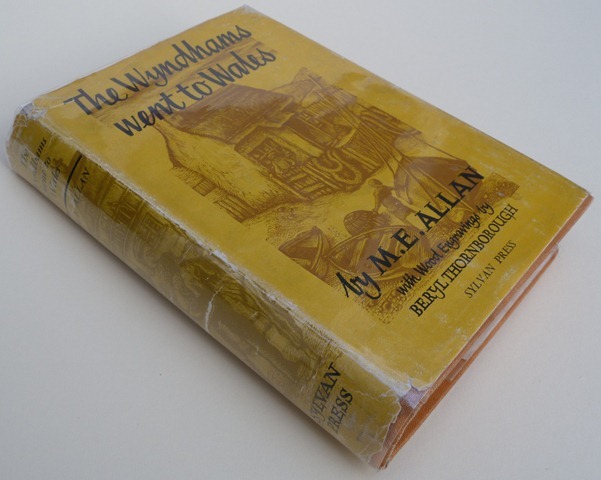 A few days later, a local boy, William Elan-Ellis, returns to school, having missed the start of term due to illness, and Verity is astonished to find him and Gwenllian fighting, but she offers no explanation beyond saying that she has met William before but that he has agreed not to talk about it. The mystery of Gwenllian puzzles Verity even more. Later that day Gwenllian once more goes on a forbidden climb, alone this time. Owen brings her back, and she is brought before a meeting of the school council. She tries to promise never to go climbing alone again if she can be a member of the mountaineering club, but this is not allowed. She explains that her father has taught her to climb, and her description impresses them, but they still cannot alter the rules for her. She rushes from the room in despair, and Verity meets her and goes with her to their bedroom. On opening Gwenllian’s drawer to get a handkerchief, a book falls out with a name on the flyleaf – Gwenllian Rhysydd-Davies. This explains Gwenllian’s secret – she is the daughter of the Earl of Llanrhysydd, the owner of the castle, and a famous mountaineer. Finances have forced them to let the house, and Gwenllian is afraid that the others will look down on her for belonging to an old family who lived in a large house, when there is a housing shortage on. Her parents wanted her to come to the school straight away, but she refused until they forced her to this term. Verity promises to keep her secret. The next day the snow arrives, and they are confined to the house. Verity is still not friendly with her cousin Daffila, and despite more efforts on the part of the others she refuses to make friends. Even an approach from Daffila doesn’t work. The snow continues for several days, and it is impossible to leave the house. Eventually they manage to dig their way to the farm, but it is only a brief respite. Verity manages type up her book. One day the post manages to get through, and there is a letter from the magazine Verity sent her poems to, accepting them all. There is also a letter from Ivor’s father, who is coming home and wants Ivor to meet him in Liverpool. It is several more days before they can leave the farm again, and this time William insists on helping, despite his delicacy. He comes in with wet, cold feet, and before long is taken ill again. The thaw comes, and with it the threat of flooding, and William’s condition becomes worse. Mr Morgan decides to take the car to fetch the doctor, and Owen goes with him, to start his journey to Liverpool. They haven’t got far when they crash, and are brought back to the house by the men from the farm and the older boys, but the doctor is now needed even more urgently, and the banks of the river have burst. Sarratt Marlow decides to try going over Rhysydd Fach to fetch the doctor, but there is no senior member of the mountaineering club able to go with her. Gwenllian offers to go, but Sarratt refuses. Seeing no other way to accompany her, Gwenllian tells her secret at last, and Sarratt agrees to take her. The others go with them for the first part of their journey, but as they are turning back more floodwater comes rushing down the slope, most of them manage to escape, but Verity and Daffila are stranded on a cairn of rock. The others go for a boat to rescue them, and the shock of being stranded brings them to their senses at last, and they make friends. Sarratt and Gwenllian return with the doctor, and Verity finally realises that she is happy at Llanrhysydd. The story ends at the beginning of the summer term, with the news that Verity’s book, Adventure on the Island, has been accepted, and they are both invited to join the Bardic Circle, for writing and singing. 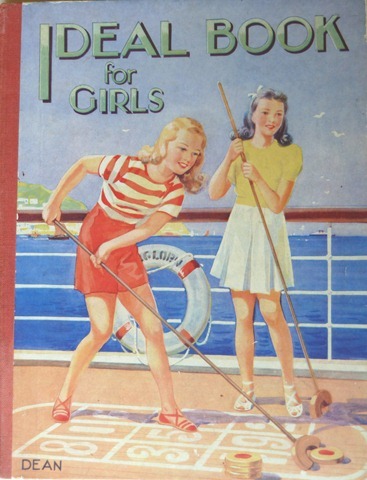 The book opens on the Isle of Wight, where Verity lives in a flat high above Ryde, with a view of the great liners and battleships in the Solent. The Griffiths live near Shrewsbury, and Mrs Griffith takes the girls shopping there before they go back to school. The school is in a little valley on the south slopes of Snowdon in North Wales. The journey to the school is described in some detail – they travel along the Nant Ffrancon Pass, which is the A5 from Bangor to Capel Curig, then through the Nant Gwynant valley, which is the A498 towards Beddgelert. The names then become fictional, as they turn into Nant Edidyr, which would seem to be the little valley on the right after Llyn Gwynant. Headmaster Edward Morgan is unlike Verity’s idea of a headmaster, she is amazed to find him at the farm in old clothes and heavy boots, looking not unlike a farmer, but he is in fact a doctor of philosophy and was a professor at Oxford. Mrs Morgan is also a BA. Verity is writing a book, and it seems likely that MEA was writing from her own experience – she wrote her first full length book at the age of 15, although unlike Verity she didn’t send it to a publisher, and it took her rather longer to see her first book in print (the war didn’t help). Verity’s thoughts when her poems are accepted seem heartfelt – “Three poems were all very well, but a book – a real book – something to hold in your hands, with the smell of new paper about it! 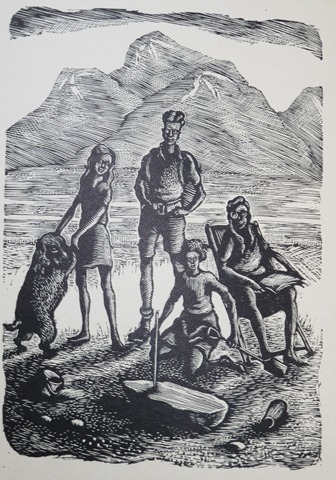 It seemed an impossible dream.” One of the older boys has already had a book published, on climbing, and the school values the arts in general very highly – there is an exclusive club called the Bardic Circle, to which members are invited after artistic achievement. The school is closely connected with the nearby farm, and the pupils help out there (on a voluntary basis). 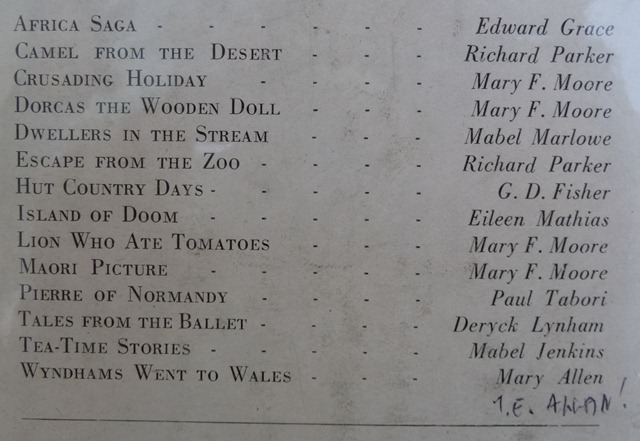 MEA worked on farms during the war, and wrote about life on farms in several books. There is dancing in the evenings at the school, but not the English folk dancing to be expected from MEA – the pupils do ballroom dancing and American Square dancing. This short story is set whilst Gwenllian and her family are still living at the castle, Gwenllian is 12 and her cousin Rhonwen is coming to stay. Rhonwen is a year older, and lives in London, and Gwenllian, thoroughly at home on a mountain, feels very inferior to her smart clothes and self assurance. Rhonwen is quiet and withdrawn at the castle, which Gwen takes for disapproval, but her friend William Elan-Ellis sees that she is actually just shy. Rhonwen expresses a desire to go climbing, so Gwenllian reluctantly agrees to take her. William still thinks that Rhonwen is a sport underneath, so to test her they plan to pretend to get into trouble on the mountain, and see how she reacts. Unfortunately they do actually become stranded by an fall of stones, and cannot get back that way. They press on to the summit, Rhonwen enjoys herself and they find that they have both been thinking that the other despises them. Rhonwen admits to overhearing them planning to test her, but they tell her that they really are stuck. Eventually Gwenllian manages to go for help, and all is well. Laura’s father has died and her mother gets at job as second Matron at Llanrhsydd, which enables her to send Laura to the school at vastly reduced rates. Laura decides that she will be looked down on as a charity girl, and goes out of her way to be unpleasant and standoffish. Eventually the others convince her that they are happy to accept her, and she gets a part in the end of term play. Mr Morgan is impressed by her acting and by her schoolwork, and offers her a school scholarship, which Laura happily accepts. This is a slightly odd story – Laura doesn’t have a uniform (this could be down to money issues, but it isn’t specified) and she sleeps with her mother instead of with the other girls. Both these things seem out of character for the Morgans to allow, setting Laura apart from the others even without her worries that the others will look down on her. 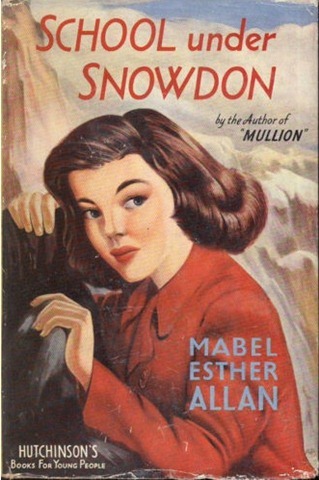 The story seems to be set just before School Under Snowdon – there are a few characters in common, and they seem to be the same ages, but Verity and Gwenllian aren’t mentioned. But then there is no mention of Laura or her mother in School Under Snowdon, so it’s not definite when it’s set. Gwyneth Parry is horrified to find that her cousin Iolyn Parry is to join her at school at Llanrhysydd, as she has inadvertently given Lyn the impression that she is popular at school and a keen mountaineer, when in fact she is terrified of the mountains, much preferring to spend time in the valley, by the river and at the farm. But she wanted to keep the respect of her younger cousin, so she has recounted tales in which she had no part. Lyn is too young to join the Mountaineering Club, but hopes to have some adventures on her own, which horrifies Gwyneth. 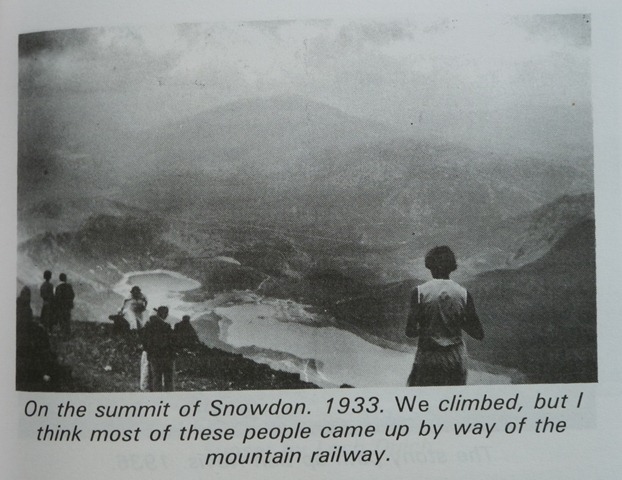 On the second day of term there is a mountain walk, which Lyn assumes that Gwyneth will take part in, and Gwyneth is surprised by herself and by the friendliness of the others, who she has assumed to despise her because of her lack of mountaineering ability. A couple of weeks later, Lyn breaks out and sets off on her own up Rhysydd Fawr, and Gwyneth decides to go after her and try and bring her back before she gets into trouble. She leaves a note for Gwenllian and sets out up the mountain, managing to get almost to the top before she finds Lyn, who has lost her nerve and is sheltering, wet and cold and with an injured wrist. She gets her part of the way down before she meets the rescue party coming up. On the way down Gwyneth confesses to Lyn that she has exaggerated and Lyn says that she has partially guessed, but that Gwyneth has proved that she is a good climber after all. 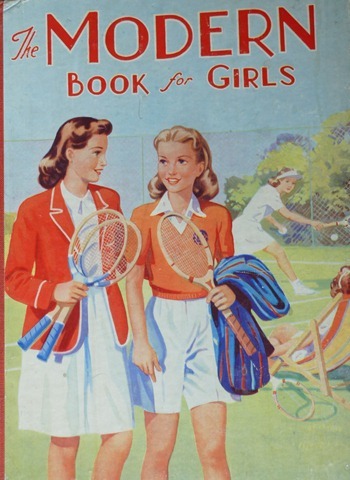 Gwyneth is persuaded to join the club on more outings, and becomes more popular in the school. The story is set the term after School Under Snowdon, Gwyneth is in Merioneth with Gwenllian and Verity. 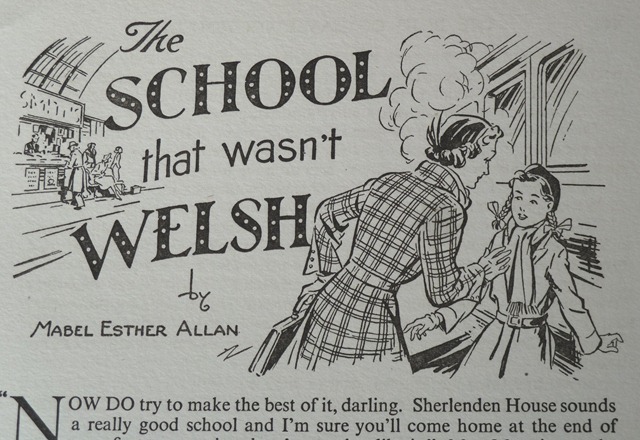 This is a very slight connector, as it is really set at Sherlenden House School, which is the school in Chiltern School, but the heroine, Glynne, really wanted to go to Llanrhysydd Castle, and compares Sherlenden unfavourably with Llanrhysydd for most of the story. 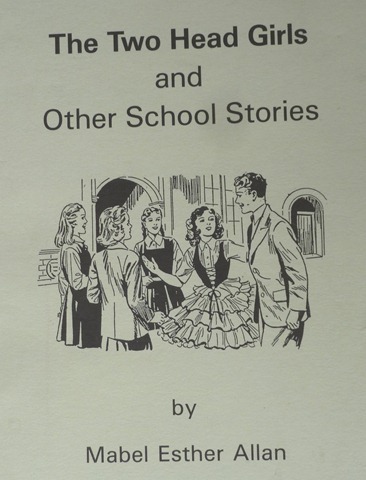 It was first published in Dean’s Modern Book for Girls, and later republished by MEA in her collection The Two Head Girls and other school stories (1992). This isn’t strictly a connector, but it’s a short story with the same name as Verity’s book, and it is set on the Isle of Wight. But the story is completely different from the brief mentions we get of Verity’s story – we are told that that has characters pursuing a villain into a lighthouse, this is a light tale of a child stage star trying to keep out of the eye of the press.